My attention today was turned to Morden Park. Although it brightened up later, the morning was a good ten degrees colder than yesterday, blowing a gale, overcast, and occasionally drizzling. 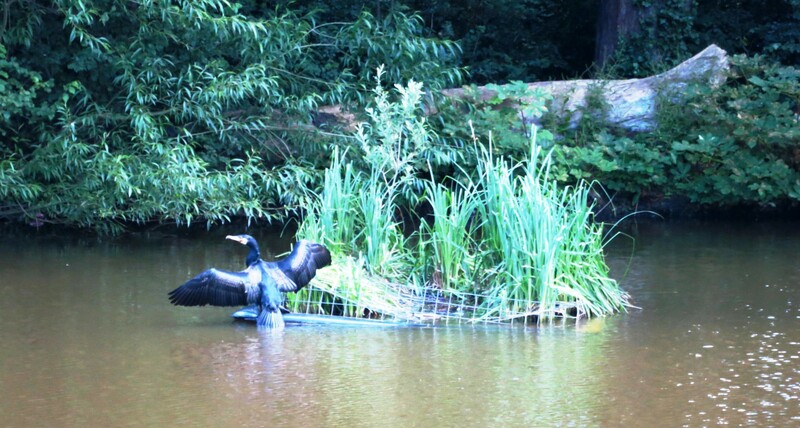 Instead of circumperambulating (I just coined that) the park, I decided to ramble across it. This proved beneficial, although on what I thought was my return journey a discarded sweatshirt I had seen earlier alerted me to the fact that I was going in quite the wrong direction. I did an about turn and soon had the mosque (see post of 18th. May) in my sight, telling me I was on the right track. I was to have a series of meetings. The first was with a scantily clad couple sitting on the grass attempting to have a picnic. Especially as the woman was wearing a strapless sundress I told them they were stalwarts. They were already regretting their decision and said they wouldn’t be staying long. Although the young lady declined to be photographed she did say I was welcome to write that I had ‘seen the mad couple’. On the far side of the park, at Morden Park House, a beautiful building which is now the Registry Office, a wedding had just taken place. The bride, also in a strapless dress, was, despite the danger of goosepimples, looking very happy and very lovely. The photographer, much more suitably clad in a warm coat, periodically dived into her bag to change lenses, advising her subject not to get cold. Some chance, I thought. I didn’t ask if I could take a picture. 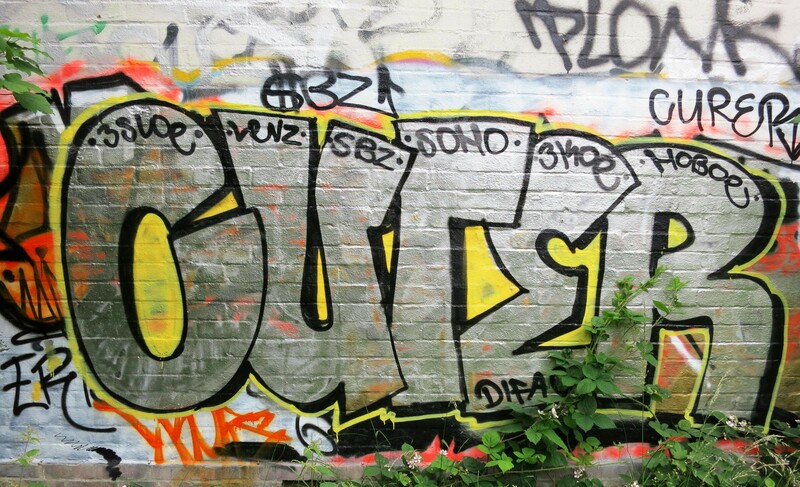 Abutting the park itself is a now derelict former GLC (Greater London Council, an earlier governing body) sports ground containing disused tennis courts and cricket nets which are still used by young Asian men. 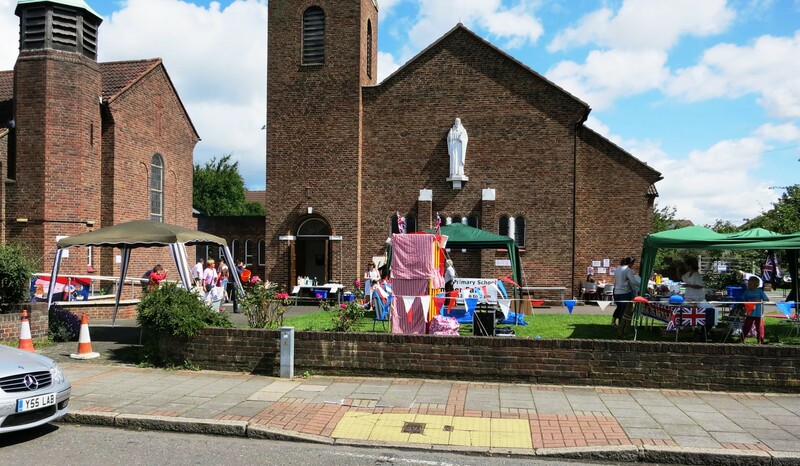 Apparently there had been a long-running battle between the Council, who wanted to sell the land for a golf driving range, and the residents of Hillcross Avenue who opposed the plan. I was therefore amused to see a man with a golf club with which he was driving a tennis ball for his dog to chase. 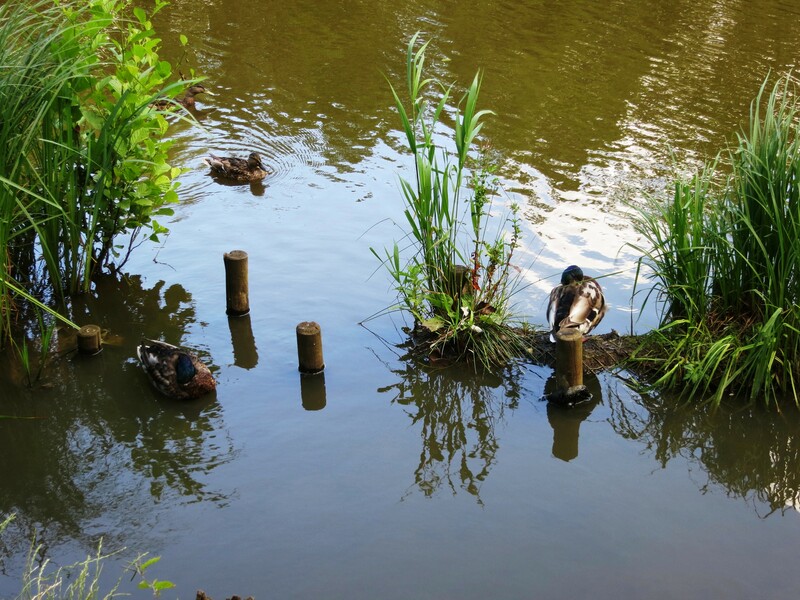 As I caught up with him and began to chat we realised we had met back in the real winter in Morden Hall Park. Then he had been smoking a pipe which he has recently given up after 40 years. His moustache was still nicotine stained. Further on I discovered that there is a Council-maintained nine-hole golfing range in the park. The man practising his putting whom I engaged in conversation told me that the masses of parked cars on a roped off section of the grass were occupying a supplementary carpark for Wimbledon tennis. 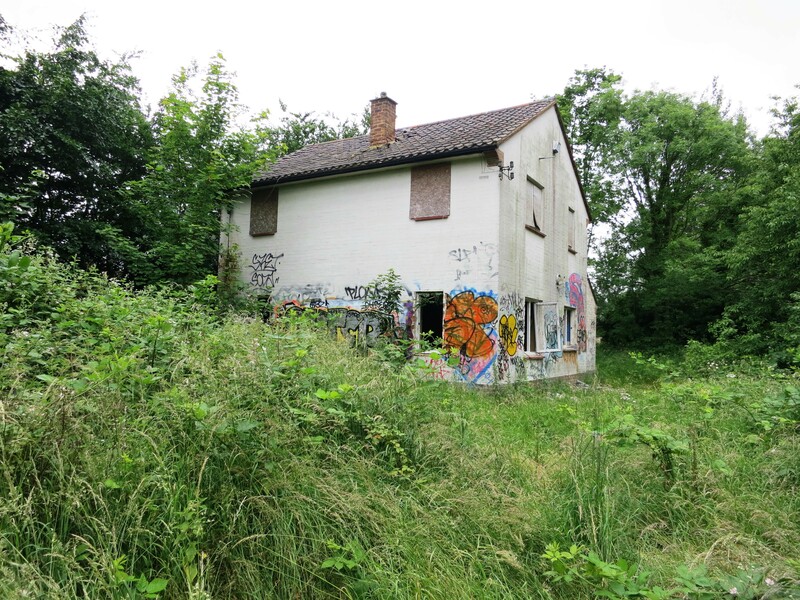 Enclosed within an overgrown copse at the entrance to the former schools sportsground is a derelict house. This once attractive building, for as long as we have been in Morden has been seemingly securely boarded up and covered in graffiti. I have often wondered what it looked like inside; whether it was GLC staff accommodation; and whether it might be for sale. Today the thick plywood coverings had been removed from the ground floor windows and doors. It is now full of rubble, some of which someone has used to smash their way in. As I left the area a cheerfully optimistic young Asian came through the broken down fence, through which I always gain access, wielding a much-used cricket bat. Other, traditionally attired couples were quietly making their way along the path for their regular trips to the mosque. For ‘us tea’ I made a sausage and gammon casserole. It went down well with an excellent Cotes du Rhone – Terres de Galets 2011. The wine was from Sainsbury’s; the meat from Lidl, equally as good as anyone else’s finest. As a footnote I might add that when it became defunct the GLC handed over its property to local Councils. The burden of maintenance then fell on the recipients. In that manner Beauchamp Lodge Settlement, the charity mentioned in yesterday’s post, received it’s eighteenth century building from Westminster City Council at a peppercorn rent of £1.00 per annum. Eventually, being unable to afford the considerable maintenance, the Committee, through the intervention of Anne Mallinson, was able to purchase the building, sell it on, and move elsewhere. This did prevent the building from becoming like the house in the former sportsground. Setting off early this morning for coffee with my friend Carol, I took my usual route through Morden Hall Park and along the Wandle Trail to catch the tube at Colliers Wood. This was a dull, humid and rather unpleasant walk. Some of the fallen trees were being sliced up into large Swiss rolls. By the time I left Carol’s, just before midday, the sun was out and we had a very fine day. The whole of London seemed to be basking and sweating in the heat . I decided to wander around the area of Victoria, which I know very well. I thought I might stop and read in Grosvenor Gardens, alongside Buckingham Palace Road, and did indeed settle on a bench there. I didn’t read, however. It seemed too much to struggle against the glare of the sun on the paper, and I was much more interested in what was going on around me. There were many other readers squinting away. 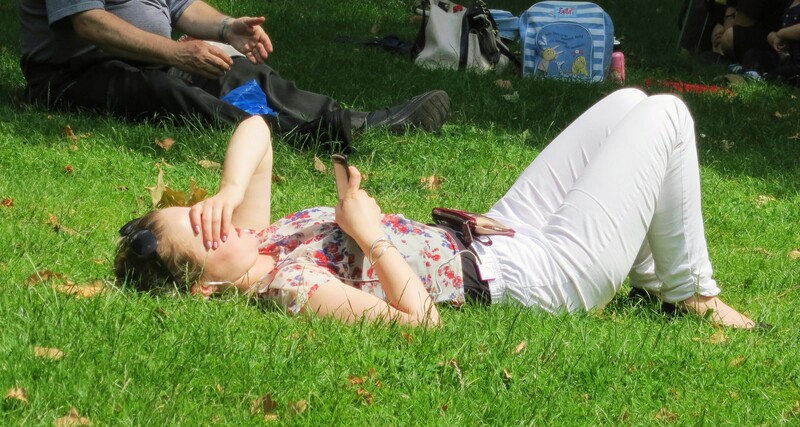 It was then I noticed a young woman, shielding her eyes, lying reading from her Blackberry. She managed, despite being in the full sun, to look remarkably fresh. Seeing the potential for this day’s header, I photographed her. Now, of course, no way could I publish this picture without her permission. With trepidation I then approached her and sought her blessing, offering to delete the picture if she wasn’t happy. She was happy, and took the details of my blog. So, anonymous young lady with a Blackberry, I thank you. Further along the side of Victoria Station I noticed another far less fortunate young woman. She lay in a doorway surrounded by her bedding and her bags; her head lolling; her eyes shut; her mouth open; motionless, with a soggy, unlit and unsmoked roll-up adhering to her bottom lip. Feeling rather guilty I moved on. Unhappily this is not an unusual sight in central London and most of us prefer to leave such situations to those in authority. As often when I visit Carol, I had taken the route past City Hall, which holds many memories of my time in the 70s and 80s as a Westminster Social Services Area Manager. Some of this period was during the infamous Shirley Porter era. Those memories are best kept to myself. I can, however, take this opportunity to tell another footwear story. For some 15 years or so I was Chairman of Beauchamp Lodge Settlement, a charity situated in Westminster. Sometime in the 1980s Anne Mallinson, who served on this Committee, and was at one time or another Chair or Vice-Chair, was the Mayor of Westminster. Anne was kind enough to invite Jessica and me to one of her mayoral dinners at City Hall. In those days, as part of my marathon training, I ran everywhere, carrying my working clothes in a backpack and diving into any suitable public toilet to clean up and change. Since there are very suitable facilities at City Hall, that was the plan on the evening of the function. Now, my attire for the event was to be formal dress wear which would not have been appropriate for my working day. Jessica was therefore delegated to drive to the City Council headquarters bringing my evening wear for me to change into and I was to meet her there. I arrived in as hot and sticky a condition as almost everyone was in today, grabbed my box of clothes, and entered the gents in City Hall. Having had a good wash I then began to dress. Ah! No shoes. They must be in the car. No such luck. Jessica had forgotten them. All I had were my best New Balance running shoes. I wanted to go home. Nevertheless I decided to brazen it out. During the pre-dinner drinks, when circulating among the guests, I vainly hoped no-one would notice. I found myself in a group with the rather important guest of honour. When his eyes, having strayed to the floor, rapidly looked up and swiftly focussed elsewhere, I said: ‘Congratulations. You’ve spotted the deliberate mistake.’ Of course I then had to tell the story, which turned out to be a most convenient ice-breaker. Not to be outdone, Jessica managed to cap this. She was placed between two eminent elderly gentlemen. One of them, politely drew her chair back to help her into her place. With her back to this courtesy, therefore being unaware that her seat was no longer where she thought it was, she promptly sat on the floor. This evening we visited Becky and Flo and partook of a Deshi Spice takeaway accompanied by Cobra Beer. Becky continues on good form and is wondering why she had been warned that this would be the worst week. Hopefully she will continue to wonder. Although it brightened up a bit later, this morning was dull, heavy and overcast; almost as if it hadn’t slept well. I took a turn round Morden Hall Park then decided to go in search of a tortoise around the Hillcross Avenue area. (see yesterday’s post), and reward myself with a Martin Cafe fry-up. I didn’t find Brendan, but the breakfast was as good as ever. On the way to the park I saw a man pick up a fallen branch from the street and stick it in the shrubbery in the garden of a woman who, although working on her beds, had not seen this happening. I extracted the branch and, as she was looking at me rather strangely, thought I’d better explain what was going on. 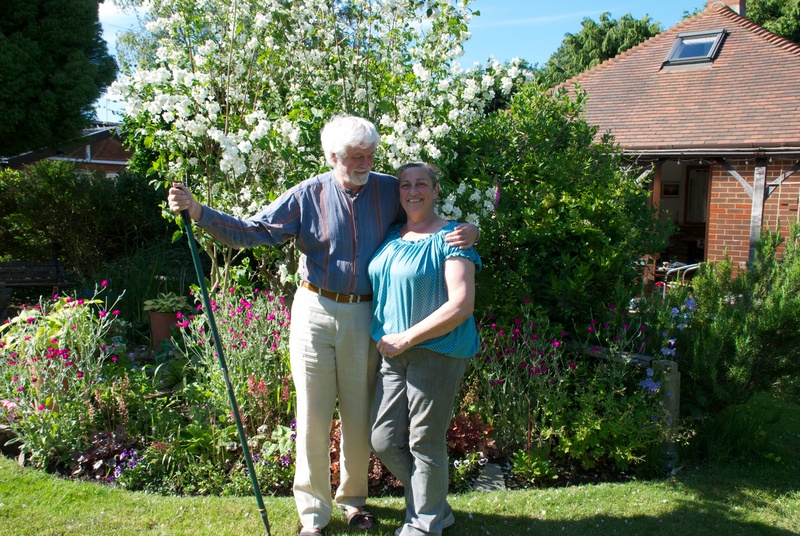 We then got talking about gardening. She was an elderly woman suffering from asthma and was unable to get out into her small plot as much as she’d like. Her children kept trying to persuade her to get a gardener, but she was determined to do it herself. She was interested to learn about our activities in The Firs. 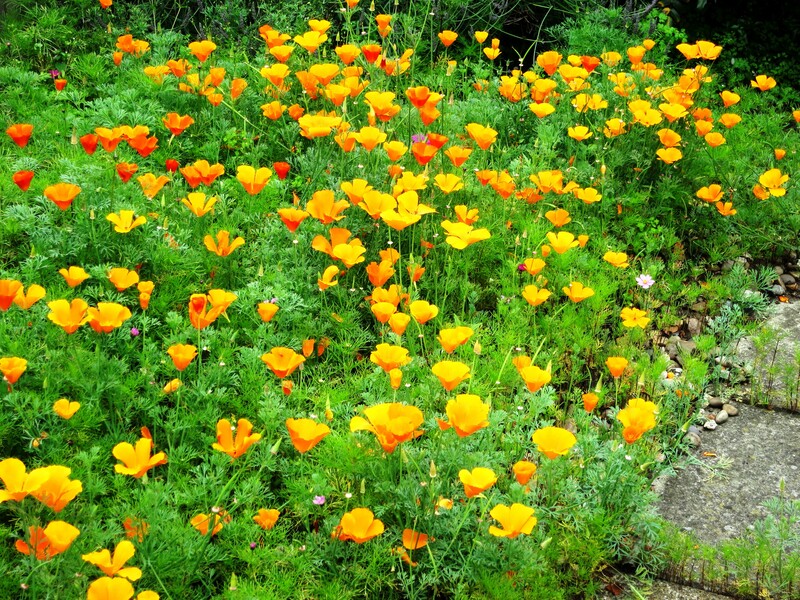 Pointing out her California poppies, of which she was clearly proud, she said they were all self-seeded. When I asked her if I could photograph them she looked at me with an even more puzzled expression but had no objection. 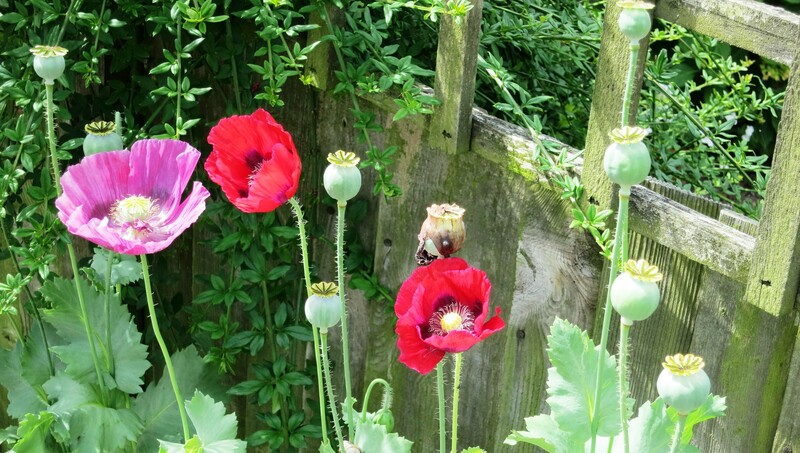 The Icelandic poppies in the picture above were growing on a path between two houses in Hillcross Avenue. The park itself was quite quiet this morning, although the meadows were peppered with junior schoolchildren on a field trip. This afternoon was spent writing clues for The Independent Crossword. A liver casserole Jackie made earlier (some months earlier) provided our evening sustenance. Hardy’s of Australia produced the 2011 Shiraz/Cabernet to accompany mine, whilst Jackie drank her customary Hoegaarden Blanche. On this fine summer’s day I set off for Cannon Hill Common, with the vague idea that I might be able to take some nature photographs with which to illustrate this post. 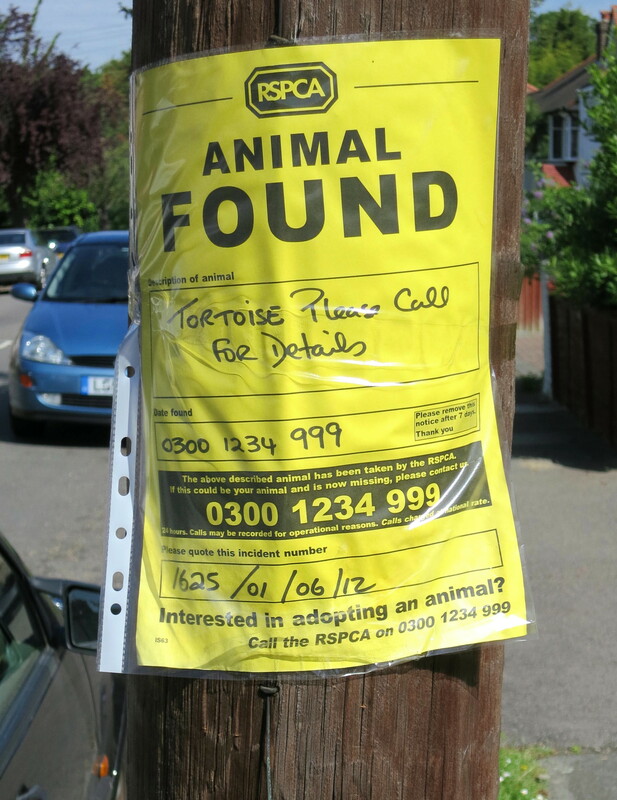 In Maycross Avenue I spotted an RSPCA notice fixed to a post announcing that a tortoise had been found. Without anything particular in mind I photographed it. I then began to wander aimlessly, hoping I might find a new route to the common, but sensing I was moving away from it. There now seemed no purpose to my walk. I was covering streets I’d never traversed before, and, as these roads between Hillcross Avenue and Grand Drive seem to go all over the place I hadn’t much idea where I was until a bus stop signed in the direction of West Sutton suggested I might be heading for Grand Drive. This was indeed the case and I walked up to the end of Hillcross and along it for a while until diverging onto the path between the gardens of that street and Morden Park. 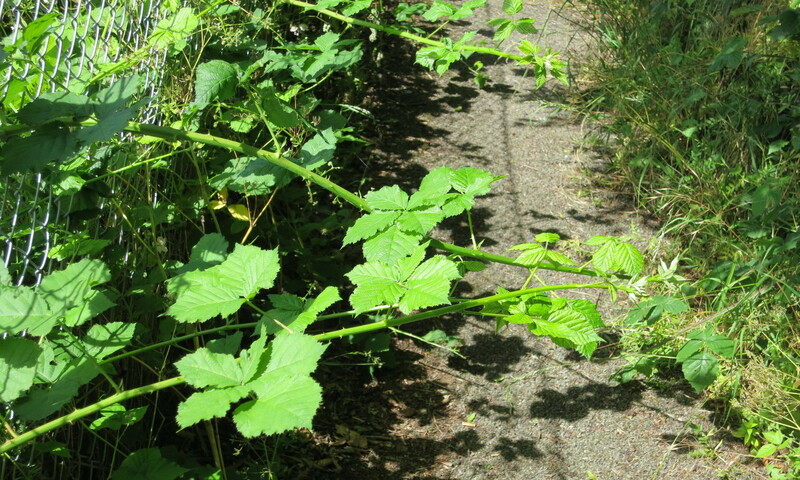 This was almost a bad mistake, for the path was very overgrown and at one point I had to crouch low to wriggle under a fallen branch spanning the fences on each side of the path. At one time I would have happily crawled through what was effectively a tunnel, but now it’s far too much effort to get on my hands and knees unless there’s something else I can do whilst down there. Ah, but there was a purpose to my meanderings. I was clearly being guided by whoever or whatever is above. Some distance along Shaldon Drive, which I couldn’t find now without a map, there was another notice pinned to tree. Have you guessed it? 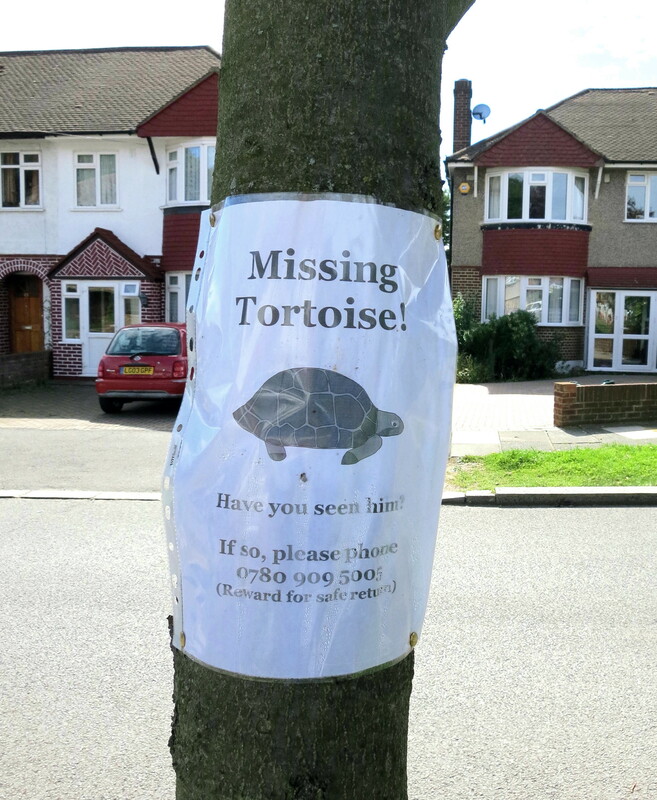 Yes, it was a notice offering a reward for the return of a lost tortoise. Naturally I rang the number on this sign. When I explained that I may be able to help the woman who answered to find her tortoise she and I both became rather excited. She asked me whether I’d remembered the number on the first poster, and, of course I was able to say that I had photographed it and arrange to call her back when I had summoned the image to my camera screen. I explained what I was doing with my walks and why I had taken the picture. When I called back I was also able to give the date when the animal had been found and this seemed to fit. As she was currently at work she would let me know later whether it was her tortoise or not. I asked her his name, saying that, of course the story would be blogged. Now this allegedly slow-moving creature had travelled quite a distance, so perhaps I should not have been surprised to find that his name was Brendan, after Brendan Foster the 70s Olympic champion runner. By coincidence, I had known Brendan’s wife’s sister who was married to my friend Tony, and Brendan had undertaken to look out for me and give me a mention when commentating my first London marathon. Unfortunately he had been unable to pick me out in the crowd, which was actually just as well, because I was running in someone else’s place. Jackie came home early this evening so we could visit Becky. We decided on a takeaway from Deshi Spice. Four people perusing the menu, making choices, then changing their minds; with one person, Jackie, writing down the orders took the usual age to organise. Jackie rang to place the order. No reply. Becky had a look at the menu brochure. Closed on Tuesdays. Just like Paris where everything is ferme Mardi. Not good for Jackie’s nerves. As Becky felt up to it we decided to go out for a meal at The Raj in Mitcham. We had been there before, but it had changed hands since our last visit. It was empty but for one sole middle aged woman seated with a meal and one gentleman waiting for a takeaway. None of the tables were set. We were shown to a table, spread, like the others, with a paper tablecloth. The adjacent table was similarly covered, except that the paper looked as if someone had eaten their meal straight off that, having dispensed with plates. We certainly didn’t have any. Nor cutlery. Nor napkins. One of what we realised was the only two staff took our order. Then we sat. And we sat. And watched Mitcham passing by or waiting at the bus stop across the road. Whilst nothing was happening I received a call from Sue, Brendan’s owner. Unfortunately the found tortoise was not Brendan. Brendan was 70 years old and the foundling was a baby. Great disappointment all round. In fact this was the second other tortoise found since Brendan’s disappearance. So, if any of my readers come across a tortoise, exactly contemporary with me, answering to the name of Brendan, please telephone Sue on 07809095005. She would love to hear from you. Getting a little impatient after half an hour or so, I wandered into the kitchen and asked if we could have our drinks. The man who had taken our order, now on kitchen duty, said he was making them. Given that they all came out of bottles I returned to our table hoping that something had been lost in translation. Eventually the popadoms appeared. Now, it is my firm belief that popadoms are a clear indicator of the quality of Indian food. These were excellent. Maybe, just maybe, our patience could be rewarded. Still no drinks, however, nor any napkins or cutlery. Actually there was an item on the menu labelled Aloo Cutlery. We were wondering whether we should have ordered that. I went over to the cutlery rack and brought a container over to our table where we all helped ourselves. Jackie and Becky had serviceable napkins in their handbags, and I helped myself to the half one under the popadoms. We could see a secondhand one left by the woman at the table opposite but Flo, ever resourceful, tore off the corner of the tablecloth for hers. Finally the drinks arrived. My Cobra was lukewarm, but no-one else complained about theirs, and it might have caused untold delay had I mentioned it. Then came the surprise of the evening. We were all served together with a perfectly presented and deliciously prepared array of excellent food. When we’d almost finished our meals the napkins arrived. If you are not seeking sophisticated ambience, don’t mind helping yourselves to cutlery, bring your own napkins, and can live with rather grubby surroundings, but want first class Bangladeshi food, then Mitcham’s The Raj is the place for you. As we left we all stepped over the half-eaten fried chicken leg deposited in the doorway, presumably by a customer of Dallas Chicken on the opposite corner of the street. And so to Links Avenue and bed. Having spent an hour this morning ‘getting my head round my new camera’, in the process being surrounded by various connecting leads; a CD Rom; a lead with a plug on it; a ‘getting started’ booklet; a charger; oh, and a camera, and not really having got very far except for a couple of out of focus pictures of a sofa and cushions, it was fairly obvious where my feet were going to have to take me. This was a round trip to Jessops in Wimbledon. Actually the two pictures featured today were taken en route to Jessops, so it wasn’t all bad. I fell at the very first hurdle. The camera is so small that you are enjoined to fix its strap so that you can wrap it around your wrist in order not to drop it. This initial instruction I was unable to perform. Anyone who read yesterday’s post will know that my camera was a display model. This meant that it probably contained an already charged battery. I felt fairly confident in skipping the battery charging section. There were other setting up procedures which to my uneducated eye staring at the various icons, numbers, and letters on the screen may or may not have been carried out. One of these, said to be essential, was the setting of time and date. I didn’t want these printed on my pictures, so why were they essential? Pass. Panic. Perambulate. Off I trotted to the experts. An elderly couple in Mostyn Road were amused to see me photographing all sorts of stuff, like (out of focus) convulvulus. 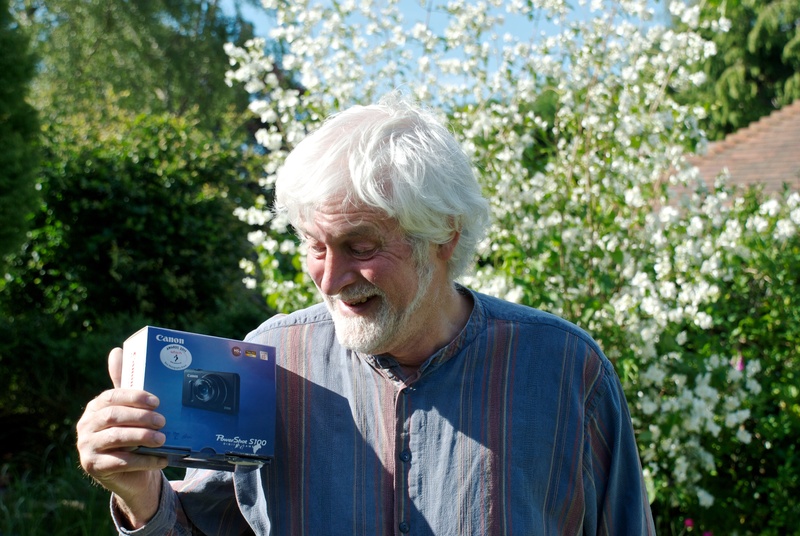 I explained it was my new toy, and the woman said that after five years she hadn’t really got her head round hers. ‘I’ve got lots of pictures of my feet, fridge door, mantelpiece…..you name it, because I keep pressing the wrong bits’. ‘I’ve just done that,’ said I. We had a laugh and I moved on just in time to see that I was being approached by swarms of boys from Rutlish school presumably freed by the bell. I had hoped by now to have completed the cyclists theme begun on 19th. June. However, despite the danger of seeming to have a bee in my bonnet about them, I have to report that two of the boys in the leading phalanx were coming straight at me on the pavement doing slow motion wheelies abreast of each other. The boys alongside them had to make way for me. By the time the next lad on a bike approached me I had had enough of stepping out into the road and held my ground. He bruised my knuckle as he swerved across my path. At least he was trying to avoid me, and did apologise. I decided to walk into the school and have a word. I was seen by a gentleman in authority who may or may not have been the headmaster. He was neither owning up to being the boss nor offering his name. If I could identify the boys by picking them out after having waited at the school entrance the next afternoon something may possibly be done; otherwise it was all rather difficult because if the boys were told to cycle in the road the school would be in trouble if one of them ‘got whopped’. I politely stated that of course I couldn’t identify the boys and wasn’t looking for retribution, rather some sort of ruling or guidance from the school. Perhaps I would like to come back later and speak to the police officers attached to the school. No, I wouldn’t. I was thanked for bringing the matter to his attention. C’est la vie moderne. I was reminded of a walk along the Ridgway in Wimbledon village just over a year ago. A 200 bus was being marshalled by two police officers ensuring that the melee of schoolboys from Wimbledon College were keeping some semblance of order. Some lads were being turfed off the bus. I told the representatives of law and order that had I behaved as the boys were doing when I was at the school 50 years ago I would have been before the headmaster in the morning. I was in fact no angel, but when I did anything out of order outside school, like getting my rugby boots stuck in an apple tree which I was trying to scrump, and consequently being unable to play a match, or wittily (I don’t think now) changing a street name with whatever was the then equivalent of a marker pen, I was inevitably shopped and for the high jump. Am I showing my age? Am I being an old git? I don’t care. Maybe I was a bit out of sorts because I was struggling with my camera. I don’t think so. As always when I use the Graham Road route I experienced a glow of pride when I walked past number 130A. This extremely tasteful new-build was created by my sons Michael and Matthew and Michael’s small and friendly workforce. Michael’s firm, Able Assignments, had done some structural work for the woman who owned the house next door. She had wanted for some time to sell part of her garden for development but wanted craftsmen she could trust. Having been pleased with his work, his manner, and his reliability, she invited my son to buy the plot and build a house. No. 130A is the result. I believe this property is an exciting hybrid of old and new ideas. 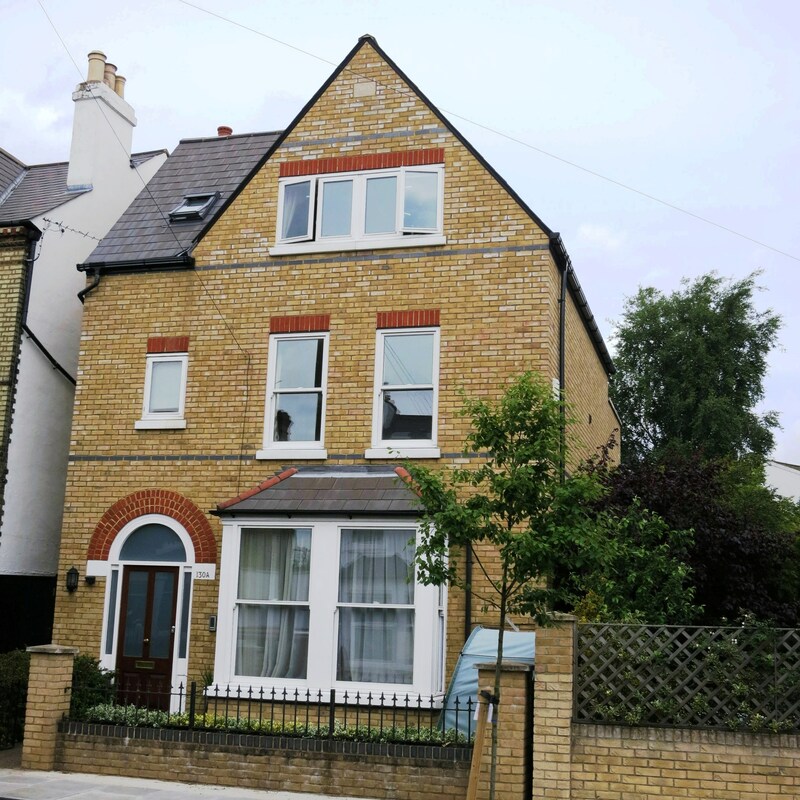 Many of the features, such as high ceilings; ceiling roses; deep skirting boards; and solid wooden panelled doors, were inspired by the Victorian architecture of Lindum House in Newark. These are combined with top quality modern kitchen, bathrooms and entry system, with more than adequate storage space. I wouldn’t mind living in it if I could afford it. The man at Jessop’s put me right on various issues, sorted the settings, and explained that the out of focus pictures were so because the flash was turned off and therefore not operating when there was insufficient light, resulting in camera shake. He immediately reassured me by telling me that most people couldn’t attach the strap, and showing me why. I hadn’t gone ten yards out of the shop when I had forgotten how to zoom in on a picture I had taken. Back in I went for a repeat lesson. Whilst cooking this evening’s Methi Gosht I managed to slice the skin off a broken knuckle with the lid of a ghee tin. The knuckle is one of two I broke playing Rugby many years ago, so it sticks out a bit more than it should. I am not going to seek sympathy from my friend Judith Munns, because she’d probably think it served me right (the break, not the cut). My Methi Gosht was accompanied by Cobra beer, Jackie’s with Hoegarten. Having been promised rain all day today the weather was kind to us and turned out much brighter than yesterday. We therefore had a good morning’s planting. This was a welcome change for me, having spent a year preparing soil by digging, weeding, and composting. This seemed much the lighter option. Jackie, Elizabeth and I went to buy Mum’s shopping and take it round to her, after which we paid a visit to Jessop’s. It is so different now than in the days of my youth when no shops and very little else were open on Sundays. As a child I could never go down the road for a loaf of bread. We had to plan ahead and there was no room for impulse purchases let alone cameras. Yesterday we had discussed the purchase of a camera but had not wanted to stop the gardening as we had expected rain today. ‘No problem. Jessops will be open tomorrow,’ was the solution. I have been a keen photographer all my life, but have stubbornly insisted on using film. I have a very good Canon and an even better Leica and will continue to choose colour slides and negative film for my main work, unless of course the experience I have sought today convinces me otherwise. 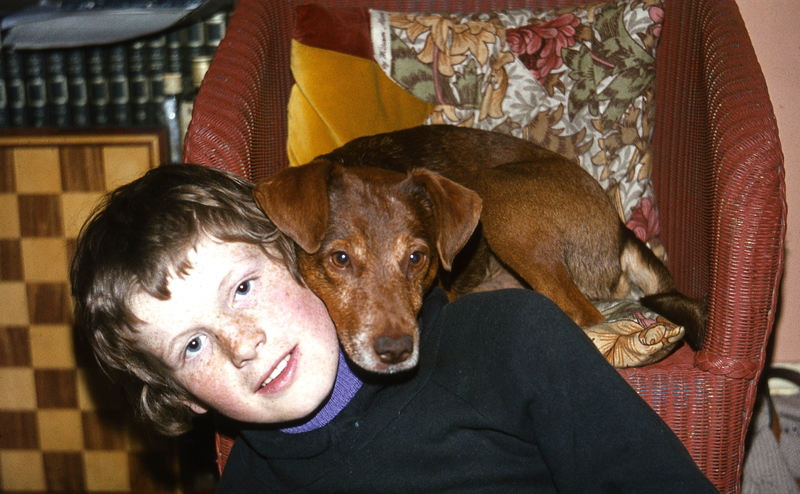 Over the last few years I have been working my way through thousands of slides and negatives from as far back as 1963; scanning them with an Epson; giving them the Photoshop treatment; and printing them on my Canon printer. I’d never really need to take another photograph. Rather like I’d never need to buy another book. Unbeknown to him it is my friend Dominic who is the reason for the Jessop’s trip. Having read a number of my posts he was complimentary but said he thought they could be enhanced by photographs. Because of their purpose these pictures should be as instant as possible, making a move to a digital camera inevitable. Yesterday I asked Elizabeth to photograph the rose arch mentioned in that day’s post, so that I could start the requisite illustrations. Jackie then offered to buy me a digital camera for my birthday. I snapped up the chance. I am adding two pictures to yesterday’s publication. Let us return to the trip to purchase the camera, which we had thought would only take a matter of minutes. First we had to choose. I’d gone in with two recommendations which narrowed the field somewhat. I thought I’d best tell the assistant something about me, primarily that I’d never used digital equipment, but also what I did do. He was somewhat surprised. Then there was the consideration of all the different features, most of which I didn’t understand. Then there were all Elizabeth’s more experienced and informed questions, most of which I didn’t understand. Eventually I told the young man he obviously knew what he was doing and I would therefore like to know which he would choose. He acknowledged a bias, and, indeed Elizabeth pointed out that he was sporting a Canon logo on his t-shirt, yet chose an updated version of the very same camera I had helped Elizabeth choose two years ago. That was good enough for me. Unfortunately the business of paying was even more prolonged. Firstly, the only example of the specific camera that they had in the shop was the display model. I asked for a discount on that. The manager said it was not possible, but I could have some free printing. As I’d already explained that I only wanted the camera to illustrate my blog I said this would not be of any use to me. After a lengthy discussion involving the assistant toing and froing between me and the manager we were awarded a reasonable discount. By this time, Jackie, whose patience had worn thin during the choosing process, was pacing the store like a caged tigress. The first indication we had had of this was when she rushed around the shop pointing in turn to each camera in a row saying: ‘Would you like a black one, a red one, a pink one, a blue one……’ I was then asked for my e-mail address ‘in order to activate the discount’. I was just about to give it when I thought I’d better mention that Jackie was paying for it so perhaps it would be her address they’d like. This was indeed the case so we had to interrupt her march for a time. Three or four trips were made by our friend in the Canon T-shirt to other parts of the store through a private door, it seems to collect bits that went with the camera. Jackie continued her pacing. The display camera had to be unscrewed from it’s stand, which set off the alarm. Jackie was unperturbed. Finally we arrived at the till. Unfortunately the till’s computer was not speaking to the salesman’s computer so the discount had not been applied. By this time our friend had gone off to advise someone else what they should buy. Jackie went off for a pace whilst I called our original salesperson back. He had to involve the manager who managed to unlock the problem and asked us if we’d like to purchase a second memory card at half price. Even if I thought 1000 pictures on the one card I had would be enough he wondered had we thought what a good Christmas present it might make someone. By this point Jackie was waving her card around with a wild expression in her eyes. I do believe she would have said yes to anything. I’m sure I caught the word ‘Whatever’. Having taken the least line of resistance we agreed to the additional purchase. The manager went away happily totting up his commission. The check-out girl amended the entry in the computer and Jackie almost relaxed. The bill was presented. Unfortunately it was £20 more than it should have been. This just happened to be half the price of an additional card. I asked the young woman if this could be the problem. She looked at her screen and denied the possibility. The manager was sent for. Jackie almost wilted. The manager took his time. I walked round and looked over the young lady’s shoulder. I was right, the second card had not been reduced by 50%. By this time even I slapped the desk as I said: ‘OK. Take off the second card. We don’t want it.’ Our friend Shannon (by now we knew her name), looking very relieved, took the card out of the equation just as her boss arrived. He looked somewhat disappointed. Perhaps he was just mentally reducing his commission. Back at Elizabeth’s, after a later than expected salad lunch, Jackie was let off the leash to get back to her planting. My contribution was a very little more ground preparation. Before Elizabeth’s chili con carne meal with red wine, I helped Danni go over a teaching session she was planning for a course in which she is participating. I’m proud of her already, but this, in my view, simply confirmed her abilities.